The scariest chart in the world this week, indeed this month, comes from the U.S. and plots U.S. real GDP growth with 1Q 2017 print at just 0.7% y/y. Yes, the print ranks 13th from the bottom for any positive growth quarter since 2Q 1947. And yes, the rate of growth is (a) preliminary (subject to revisions) and (b) seeming one-off (driven by fall-off in consumer demand, despite strong indicators on consumer confidence side). There are reason and heaps of arguments why this print should not be treated as huge concern and that things might improve in 2Q and on. Look at the grey bars: these take periods of expansion in the U.S. economy and average rates of growth over these periods. Notice the patter? 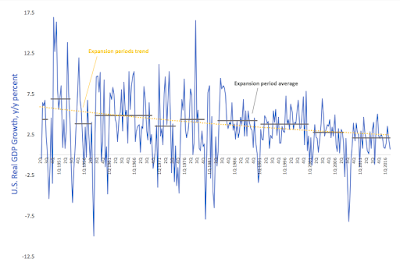 Why, yes, the average expansion-consistent rates of growth have fallen, steadily, since 1975 through today. 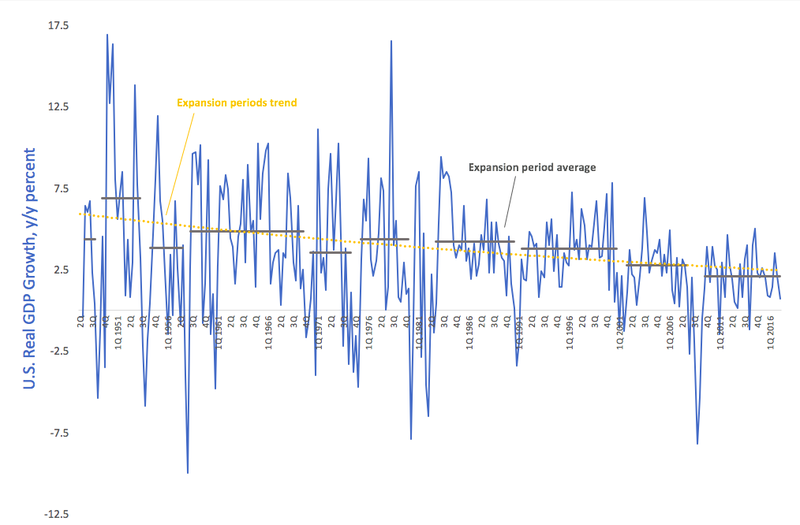 Worse, controlling for volatile growth (average rates) in pre-1975 period, an exponential trend for average expansion-consistent growth rates (the yellow line) is solidly trending down. The latest period of economic expansion is underperforming even that abysmal trend. And 1Q 2017 is underperforming that worse than abysmal average. Now, let me highlight that point: yellow line only considers periods of consistent growth (omitting official recessions, and one unofficial recession of 2001). So, no: the depth of the Great Recession has nothing to do with the yellow line direction. If anything, given the depth of the 2008-2009 crisis, the most current grey bar should have been at around 4%, almost double where it sits today. That is what makes the chart above the scariest chart of April. And will probably make it the scariest chart of May too. 18/7/17: Greece in Recession. Again.